Looking for a gift for a loved one this holiday season? I’d like to make a few recommendations. You might notice a theme here. OK, I’ll make a full disclosure: the following are books I edited. Want your mind to be entertained with some food for thought while your stomach is digesting its own food? 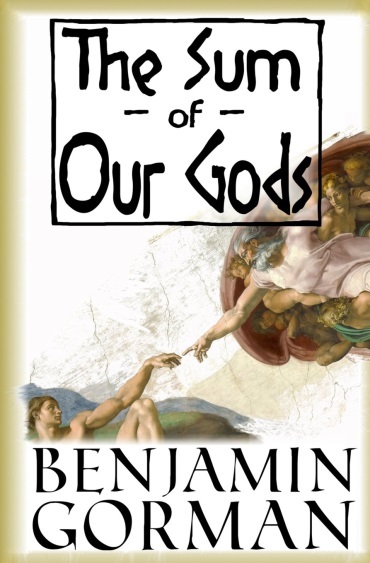 Then take a look at Benjamin Gorman’s The Sum of Our Gods. Here’s the description from the author: Joe has been cursed. He mus t meet with Yahweh, the Creator, once a week for coffee and listen to God complain. Yahweh is a crotchety old deity with a pantheon of family problems. His wife, Frigga, has basically stopped talking to Him, except to nag Him about retiring. His son, Jesus, suffers from crippling depression. Oh, and Jesus’ estranged wife is planning a terrorist attack to start a holy war. God is fed up with all the drama. He’s perfectly tired and infinitely irritable. Though God doesn’t seem to care about human problems, Joe’s little, mortal life isn’t perfect, either. In fact, it’s a comedy as black as God’s coffee. My two cents: The Sum of Our Gods, Ben Gorman’s first published novel, just blew my socks off in a quirky way. Ben’s paternal grandparents are Catholic and Jewish; their son — Ben’s father, is a Presbyterian minister — as is Ben’s mother. Ben, himself, holds a degree in philosophy, is married to a Quaker, teaches creative writing and calls himself agnostic. How could he not help but write a brilliant novel full of the gods wrestling with their demons and each other? Yes, godS. His working title for the book was “And Lo, God Took His Coffee Black” (in case you wondered.) This is a fantastic debut novel, and I can’t wait for Ben’s second! If you don’t want to think that hard, or if nonfiction is more what you’re looking for, try Paige Adams Strickland’s Akin to the Truth. Her memoir would be of interest to people in the adoption triad or anyone who grew up in the Cincinnati area in the 1960s and 70s. From the author: In 1961 Paige was put up for adoption, a more taboo and secretive topic than it is today. Paige’s adoptive family chose not to focus on the adoption, but instead function as a regular family with natural children. However, being adopted made her feel vulnerable and unreal. She longed to know more about her true self. 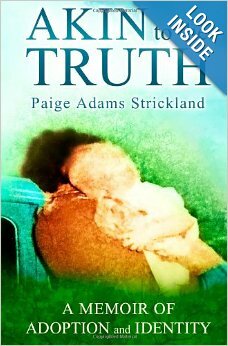 In Akin to the Truth: A Memoir of Adoption and Identity, Paige tells stories from the perspective of a child and adolescent, growing up with a closely guarded secret. Through vignettes, Paige relates feelings about her adoption to forming and maintaining relationships, caring for pets, moving to new houses and neighborhoods, losing loved ones and entering young adulthood. Her need for acceptance is juxtaposed with her adoptive father’s increasingly erratic behavior. This is a tale of family joys and hardships, friendships, falling in love and the need to belong. It is set in the era of free love, social unrest and unexpected change during the 1960s, 70s and 80s. From me: Throughout Paige’s childhood, she struggled with feelings of loss, establishing her identity, and tiptoeing through an awkward relationship with her father. Knowing that she was adopted heightened these challenges and added another: finding her birth family. In this entertaining memoir, Paige recounts how she faced her “demons,” and how she learned that she was not alone. Spreading our interest geographically and chronologically brings us to another memoir, Over My Shoulder: 1931–1945, by the distinguished Ewin Gaby. About the book: History books generally avoid the details of human life. They tell of what happened at a time, but not how it affected those living through that time. The depression of the 1930’s and the war of the early 1940’s changed the world, and history books provide great detail as to the causes and of the changes brought about. Still, how families handled these challenges cannot be told in a book of history, because each family had its own manner of living through these significant historical periods. 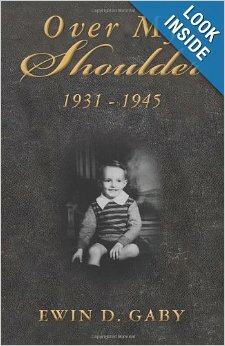 This book is the story of how a young boy and his family live through the depression of the 30’s and the Second World War. Unlike many others, his father is employed, but that employment causes them to live in 145 towns in his first ten years. When the Second World War begins, they move to New Orleans for the next four years. What a way to grow up! A few notes from me: Ewin’s book is available in paperback, Kindle or CD version. I recommend the CD highly. With his combination Texas–Louisiana accent, Ewin reads his memoir wonderfully. You can sit back and just listen to a time when kids played outside until it got dark, when mothers and kids pulled together to make the family run while fathers were away during the war, when school kids ran paper drives to support the war effort. Shoot, if your father or grandfather is no longer with you, get the CD and it’s as if you’re together again, hearing stories about the old days, when life was simple. My first book, Artists and Writers of the Harlem Renaissance (Enslow, 2002) has gone into a second printing. Now titled Harlem Renaissance Artists and Writers, it is available in library binding, paperback and e versions. In this book I profile ten African Americans who had key contributions to the Harlem Renaissance, an explosion of creativity that started in New York City in the 1920s. The Harlem Renaissance lasted for about 20 years and had even international repercussions. Harlem, New York, was the setting for a cultural upsurge in the 1920’s and 1930’s. During those decades a series of Black writers, artists, vocalists, and poets sprang forth and gave voice to the conditions of African-Americans. At a time when racial prejudice was even more overt than in our own age, it took great courage for Black artists to stand up and honestly portray their lot in America. Artists such as Langston Hughes, Bessie Smith, Duke Ellington, and Josephine Baker all provided a unique expression to what it meant to be a Black person either living in America or with American roots. This artistic movement came to be known as the Harlem Renaissance and that is the subject covered in this collection of short biographies. 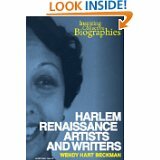 In this illustrated selection author Wendy Hart Beckman provides encapsulated biographies of ten artists who participated in the Harlem Renaissance. In each instance Ms. Beckman provides a careful outline of the artist’s background, development, contributions, and later life. This is a good reference tool for readers with an interest in African-American history or specifically Black artists of this era. The Harlem Renaissance was a significant movement in American culture and Ms. Beckman does well to offer readers a summary of some of the leading lights of that period. Hey folks! This summer I’m going to be giving some talks and conducting workshops around the Tristate, if you’d like to catch me without signing up for a multi-week class. Check out these great opportunities to hear me!